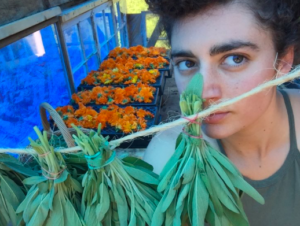 Aviva is a plant nerd, herb farmer and musician. She is also a huge fan of Hygge– if you haven’t heard of the term yet, it is Danish/Norwegian for “a form of everyday togetherness”, but also loosely translated to ‘Cozy’. Board games are Hygge. Coffee is Hygge. Therefore Aviva likes these things, and likes helping other people access these things, thereby helping the world heal with COZINESS. You can ask her questions about plants too.